Available in 6", 8", and 10" sizes. 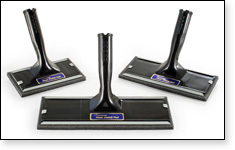 See our full line of Floor Trim Pads. 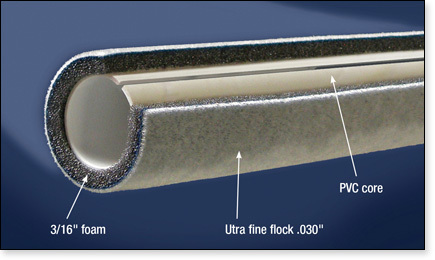 Padco's specially designed NanoFlock® material applies an ultra-thin, smooth and shed-free finish. NanoFlock® is perfect for application of floor waxes, UV coatings and other thin mil applications. 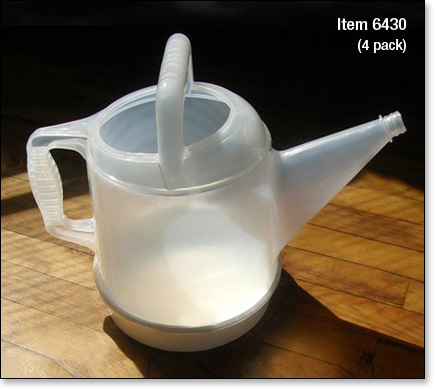 It provides greater foot-per-gallon coverage than standard flocked foam. 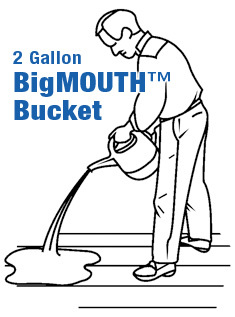 Use with waterborne & solvent based finishes on concrete, wood, vinyl, tile and terrazzo surfaces. Available in 12", 18", 24" and 30" sizes. 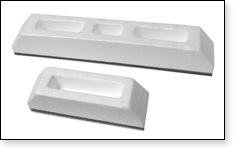 See our full line of Floor Coaters and Floor Coater Refills. Available in 6", and 12" sizes. See our full line of Smoother Applicators. Contractors have written, telephoned and e-mailed Padco to express a need for wider Padco T-Bars and Applicators. Wider Applicators would make large jobs faster, easier with less overlapping strokes. For large jobs bigger is better. Contractors would not need messy sprayers, they would not have to purchase costly machinery, and they would not have to spend time tediously taping and masking before applying finish. They would get professional results quickly with simple cleanup. Another benefit is that Padco applicators do not atomize the chemicals in the finish to create a hazardous breathing and working environment. And for speed - Padco applicators spread the finish at a rate of OVER 10,000 sq. ft. an hour with a streak and bubble-free finish everytime. In response to the overwhelming number of requests, Padco now manufactures a full 30" width BigFoot T-Bar, and 30" Heavy and Lightweight Floor Coaters. These accommodate the new 30" with Nylfoam and Woven applicator refills. 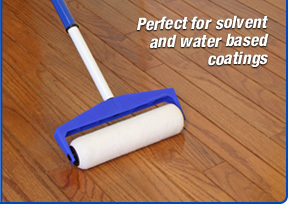 Padco Floor Coaters can be applied to hardwood, concrete, vinyl, stone and tile surfaces. Click here for see our full line of Floor Coaters or visit our Gallery Page to see these tools in action. Padco's Woven Pro-Finish roller covers are shed resistant and perfect for use with solvent and water based coatings, including new formulations of low VOC finishes. 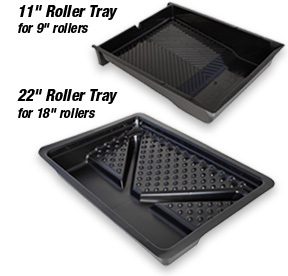 These fine fibered rollers are available in 9" and 18" sizes. 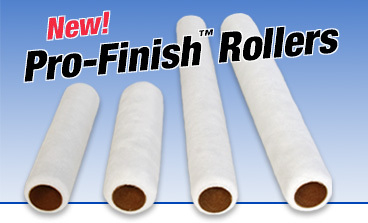 Padco Pro-Finish rollers apply a streak and lint-free finish every time. 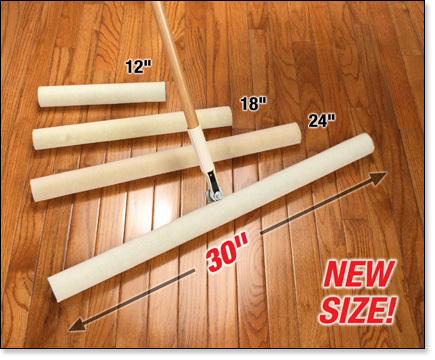 Padco Pro-Finish roller covers are excellent for use on all hardwood, cement, tile, vinyl and terrazzo surfaces. Great for use with all finishes, stains, epoxies, paints, sealers and waxes. 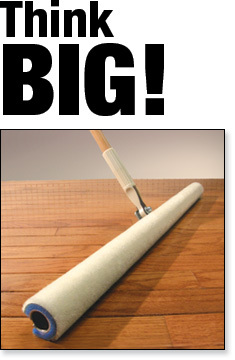 Click here to see our full line of Pro-Finish Rollers.